The data in this report backs up what I’ve seen recently when driving around greater Minnesota. It’s a common sight to see billboards advertising trucking companies looking to hire company drivers and owner-operators. These advertisements often mention that the company has generous signing bonuses. 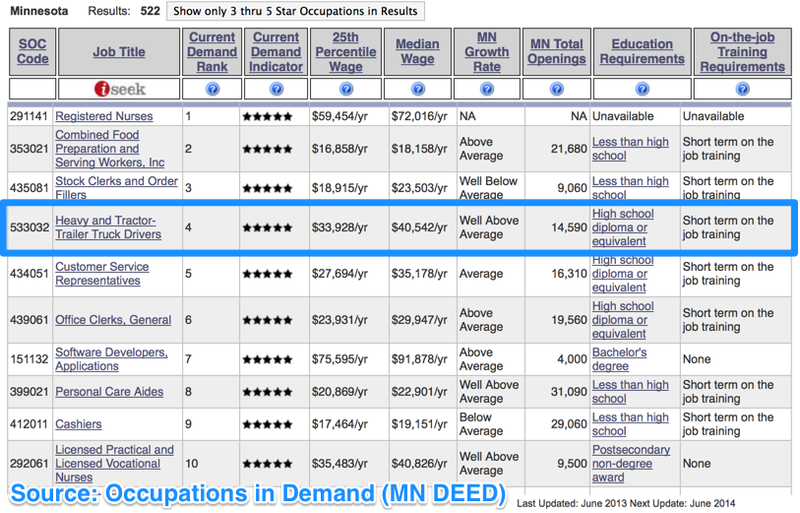 While I was going through DEED’s website, I also came across an interesting tool, DEED’s Occupations in Demand Tool. This tool forecasts the most in-demand careers in Minnesota until 2020. Driving a truck is #4 on the list! The outlook for truckers that are either leased-on to a larger company or are company drivers continues to look up, but there is also a strong need for smaller trucking outfits. Whether it’s a small fleet with up to 10 trucks, or simply an owner-operator, the American economy needs small business to keep its engine running. Of course, if you are a small trucking company and are in need of factoring, we’d love to help.